“Always name the lineage.” I heard this today from a teacher I respect for her healing justice work. She was describing the way whiteness often forgets that very little is discovered. Much of what is thought of as new can be sourced from older, indigenous cultures. History is full of instances when indigenous wisdom has been taken and rebranded by white people, claiming they had discovered something new. While the indigenous teaching may have been freely shared, it is important to name the lineage to be in right relationship with the people and the wisdom. As another teacher of mine likes to say, it is only good manners. Good manners make for good foundations. Foundations and lineage are important concepts for Capricorn, the sign of the new lunar cycle that begins on January 16. Capricorn is the sign that likes to know what brought us to this place. It is the sign that also aspires to bring us to better places through commitment and work. This lunar cycle is an opportunity to honor our lineages, to name our sources, and create good foundations for our futures. We are building. Saturn has recently entered Capricorn boosting the signal for this practice of naming lineage. Astrology has a long lineage. Ancient structures all over the world were built with relationship to the sky. Ancient peoples have always observed and found meaning in the cycles of Sun, Moon, and star. Astrology as a codified body of knowledge has roots in Mesopotamia, Egypt, and India. These strains influenced what we know as Western Astrology, but astrologers in India still practice a distinct astrology not influenced by the West. There are astrologies from Tibet and China. The Plains Tribes of the U.S. used their own constellations to time and map their migrations and ceremonies. Polar-dwelling people tell different stories about the sky than those who live in equatorial regions. The sky is local and helps us anchor to our place and to the rhythms and cycles of the Earth where we live. I give thanks to the excellent sky watchers from these indigenous cultures who maintained their connection to the Earth. They inspire me to anchor my astrology in the Earth’s wisdom too. What do you value in your life? Who brought these things to you? Who explored them? Anchored them and passed them along? Will you also use this lunar cycle to honor lineage? This lunar cycle moves across a threshold, which could be described as the movement from honoring foundations to envisioning the future. For the past few months, lunar cycles have begun near the cusp between signs. 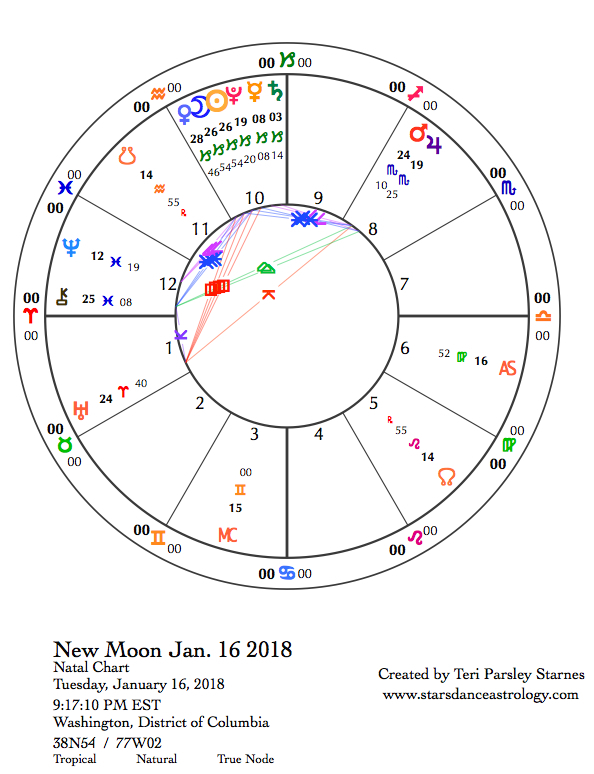 The Sun is in Capricorn now, but it moves into Aquarius only three days after the New Moon. Last month, the threshold between Sagittarius and Capricorn opened the way to the new year—to beginnings grounded in Saturn’s reality. And now, we are invited to remember the past to ensure beginnings form vibrant roots. As we cross into Aquarius territory, our spirits soar into the deep winter sky to claim the vision that heals. In the northern hemisphere, Aquarius is the air sign that anchors mid-winter—a time to start the seeds of intention that will grow over the next year. Aquarius is the air sign that pours inspiration like water upon the land. If we can dream it, we can be it. Aquarius longs to expand the bounds of what is possible. It wants to break the rules. Sometimes it seems like Capricorn and Aquarius are at odds with each other, one anchored in the past’s wisdoms and the other reaching for tomorrow’s spark of change. What if we learn to cross this threshold and stay connected to both? To name lineage is to honor those who make our lives possible now and into the future. To name lineage is to know we don’t have to invent everything. Wise ones are carrying us forward. To name lineage says we are trying to live with respect. And that may be the key to the future. January 16—New Moon: Seeding. There’s quite a line up of Capricorn planets at this New Moon. Saturn, Mercury, Pluto, Sun, Moon, and Venus are located there. We often associate Capricorn with mountains. Capricorn likes to climb. Capricorn has places to go. Does that mountain look enticing or overwhelming to you? It’s possible that you feel both, or swing between determined commitment and wanting to give up. Yep. Mountains are challenging. We have a great opportunity this lunar cycle to look at the ways we think about and respond to challenge. We can tinker with the formula for success. How about we take out competition and isolation, and put in the support of our ancestors and the lineage of wise ones living in right relationship? What then? What does success look like? How have we distorted the notion? How do we reclaim it? Uranus in Aries is the challenger in the chart for the New Moon. Uranus as co-ruler of Aquarius is goading the parts of us that are sleeping to wake up. If we are ready to change, then we are already looking for new ways to climb our mountains. If we are resistant to change, we may be shocked out of complacency. The idea is to keep evolving while preserving the life-promoting qualities that Capricorn offers. Jupiter and Mars in Scorpio are beginning to separate from a close conjunction that has plunged many into catharsis. Life has been intense. Under this influence, emotional release feels essential to our healing. Mars and Uranus are in a quincunx aspect that tweaks our responses just enough that we have a hard time resting. Is there more to release? Or is it now time to let the old wounds go to free us for renewed life? At some point in this lunar cycle, we are ready to move on. The sextile aspect between Jupiter and Pluto helps us know that the emotional work we do now will turn into rich compost for future growth.